Although the county of East Lothian - and Aberlady - were spared the worst of World War 2 ( WW2 ), that is not to say that they did not play a ( sometimes vital ) role in the massive effort for a British victory. Much was going on in the area during hostilities, a good deal of it , but not all, involving the defence of the UK coastline. The first air attack over Britain of the Second World War took place within just a few miles of Aberlady with 12 German bombers ( Junkers Ju 88s ) flying up the River Forth to attack Royal Navy ships. Aircraft were scrambled from Drem ( in East Lothian ) and Turnhouse ( Edinburgh ) airfields. These consisted of spitfires from 602 and 603 squadrons. An Aircraft from 603 got the first kill followed by one from 602 a few minutes later, the first two enemy aircraft to be shot down over Britain during WW2. Aircraft from drem had a hand in the shooting down of other enemy planes, possibly the most famous in the county being the Heinkel 111 shot down at Humbie, South of Haddington, on 28 October 1939. Defencively East Lothian was very much involved, with a variety of measures put in place to stop, or at least hold up the enemy for as long as possible. 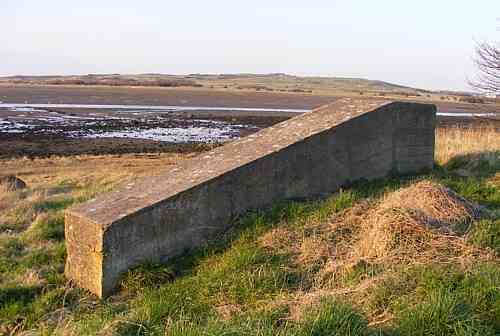 To Aberlady residents The most visible of these were the anti-tank blocks which were placed along the shoreline to the east of the village, and at right angles to them across the Peffer Burn. Some of these blocks were also positioned at the West of the village where, about a mile from Aberlady, they can still be seen. Other measures used in the area included tree trunks embedded vertically in the beaches, which between Aberlady and Dunbar were also mined. The military also used the coastline for practice. 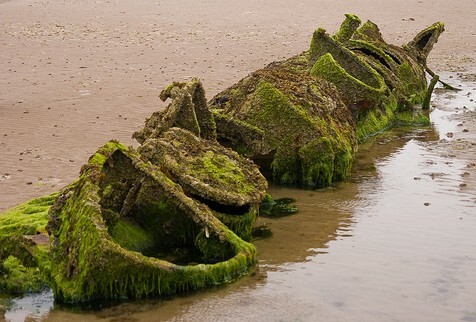 Two x-craft midget submarines moored in Aberlady Bay were used for target practice to test the effectiveness of cannon shells - the remains of the x-craft can still be seen at low tide. While at Gullane Bay invasion exercises took place with supplies brought from Edinburgh by ship where they were transferred to amphibious vehicles, then lorries, to be returned to Edinburgh to start the whole thing over again. An exclusion zone existed in much of East Lothian during these exercises. Prisoner Of War Camp In 1940 Gosford House - to the West of Aberlady - was taken over as a billet for British troops and in 1944 with more accommodation needed for German prisoners of war it became a P.O.W camp ( no.16 ). Despite being overcrowded life was made as comfortable as possible. At the camp there was a cinema, football pitch and even a band and gardens, among other things to make life easier for the prisoners. One woman remembers another way in which the village did it's bit for the war effort. Daphne Brown remembers that for a time during WW2 Naval Evacuees, herself included, were billetted at Luffness House which lies about half a mile to the East of the village. She was nine or ten years old and recalls the present owner, Mr. Hope ( himself a child at the time ) watching the 'orphans' play their games through the stair bannisters, without being able to join them. Daphne also remembers how the children would be marched 'crocodile fashion' to Aberlady school and Church, a sight that older present day villagers recall. In 1996 Mr. Hope was kind enough to give Mrs. Brown and her husband a tour of his home as it is now.